The Cheatham County School District is joining public school districts from across the state to celebrate School Board Appreciation Week and honor local board members for their commitment to Cheatham County and its children. • Focus attention on the need for continuous improvement by questioning, refining and revising issues related to student achievement. 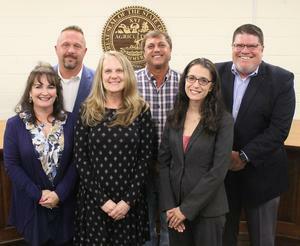 Cheatham County School Board members are: Christina Gilliam, Kimberly Messer, Jennifer Hamblin, James Gupton, John Louallen and David Risner.